Accelerating the transition to a sustainable energy paradigm requires versatile technologies that can be broadly implemented in order to match the huge energy needs that underlay our current standards of living. Molecular based photovoltaics can play a key role in this scenario, as is the most sustainable solar cell technology (in terms of energy investment on return), and simultaneously is amenable to be solution processed into any shape, can be as light as a feather, and can be produced with the largest colour pallet and transparency degree imaginable. Indeed, there is an infinite number of molecules that can be synthesised to match our needs. The bottleneck then becomes how to identify and screen potential candidates, or, in other words, how to find the needle in the haystack. In this talk I will first introduce the basis of organic photovoltaics and the materials behind. Then I will present the efforts of my team in two fronts: 1) how to make a solar cell with any desired colour [1-3]; 2) how to evaluate solar cell materials using high throughput screening methodologies [3-6]. I will finish by presenting our first trials to use machine learning methodologies in the field of organic photovoltaics. Organic photovoltaic greenhouses: a unique application for semi-transparent PV? J. M. Emmott, J. A. Röhr, M. Campoy-Quiles, T. Kirchartz, A. Urbina, N. J. Ekins-Daukes, and J. Nelson, Energy & Environmental Science 8, 1317-1328 (2015). 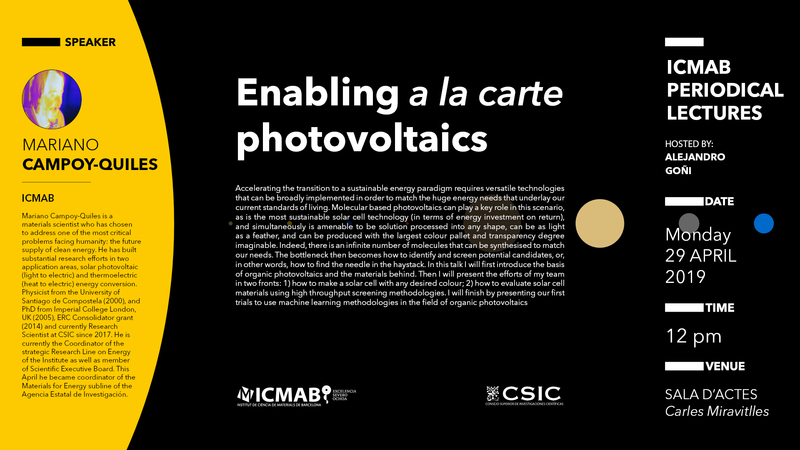 Comparing the potential of different strategies for colour tuning in thin-film photovoltaic technologies, E. Pascual-San-José, A. Sánchez-Díaz, M. Stella, E. Martínez-Ferrero, M.I. Alonso and M. Campoy-Quiles, Science and Technology of Advanced Materials, 19, 1, 823–835 (2018). Blade coated P3HT:non-fullerene acceptors solar cells: A high-throughput parameter study with a focus on up-scalability, E. Pascual-San-José, X. Rodríguez-Martínez, R. Adel-Abdelaleim, M. Stella, E. Martínez-Ferrero, M. Campoy-Quiles, submitted (2019). Combinatorial Optimization of Evaporated Bilayer Small Molecule Organic Solar Cells through Orthogonal Thickness Gradients, X. Rodríguez-Martínez, A. Sánchez-Díaz, G. Liu, M. A. Niño, J. Cabanillas-Gonzalez and M. Campoy-Quiles, Organic Electronics, 59, 288-292 (2018). Mariano Campoy-Quiles is a materials scientist who has chosen to address one of the most critical problems facing humanity: the future supply of clean energy. He has built substantial research efforts in two application areas, solar photovoltaic (light to electric) and thermoelectric (heat to electric) energy conversion. Dr Campoy-Quiles is a physicist from the University of Santiago de Compostela (2000), and has been awarded a PhD in experimental physics from Imperial College London, UK (2005), a Japan Society for Promotion of Science postdoctoral fellowship (2007), a Ramon y Cajal research fellowship (2009), a permanent position as tenured scientist of CSIC (2012), the Most Outstanding Young Researcher in Experimental Physics Award (from the Spanish Royal Society of Physics and Fundación BBVA) (2012), an individual European Research Council Consolidator grant (2014) and promotion to research scientist of CSIC (2017). He is co-author in 81 papers, including three papers in Nature Materials as well as a stream of significant papers in excellent journals including Advanced Materials, Energy and Environmental Science, Advanced Functional Materials, Physical Review and leading Chemistry journals. This output has earned him an h-index of 34 and over 4700 citations. He is also co-inventor in two patents, co-author in five dissemination papers, and has given more than 35 invited/plenary talks at international conferences. He is currently the Coordinator of the strategic Research Line on Energy of the Institute of Materials Science of Barcelona (ICMAB-CSIC) as well as member of ICMAB´s Scientific Executive Board. The 1st of April 2019, he became coordinator of the Materials for Energy subline of the Agencia Estatal de Investigación.